Part one is a general description of the YC-15 aircraft. You can view that here. 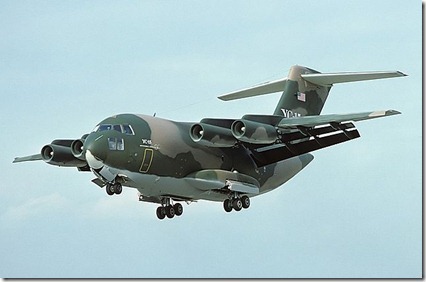 This post will detail the flight test program of the YC-15. There were 2 YC-15 aircraft,serials 72-01875 and 72-01876. 875 was rolled on 5 August 1975. The first flight was 26 August 1975. 875 flew from the Douglas plant in Long Beach, CA to Edwards AFB. The only problem during this 2.5 hour flight was a landing gear door found to be ajar. The flight itself was therefore speed limited to 200kts at 20,000ft. 875 flew 3 times over the next 3 days, conducting general flight envelope verification and expansion tests. A further 2 weeks were conducting 7 air-worthiness flights. On 12 September, 875 moved to a Douglas Aircraft Company (DAC) test facility at Yuma, AZ. 876 flew for the first time on 5 December 1975. This flight took the aircraft from Long Beach, CA to join 875 at Yuma AZ. The YC-15 Joint Test Force (JTF) personnel from the Air Force Flight Test Center (AFFTC), Air Force Test and Evaluation Center (AFTEC), McDonnell Douglas, Boeing (for the YC-14). The (Air Force Logistics Command (AFLC), Tactical Air Command (TAC), Army and the USMC played minor logistical roles in the flight test program. NASA also sent (short take-off and landing (STOL) engineers to analyse data gleaned in the AMST program. The core pilot cadre for the YC-15 was made up of 3 contractors, 3 AFFTC and 3 AFTEC pilots. The competing aircraft were housed in separate hangars with the JTF office between the 2 contactors. This became the model for both the ATF and JSF programs. The consensus amongst the test pilots and crews was that the YC-15 had generally good handling qualities. The aircraft was easy to fly with the SCAS off and on. There was concern that the pilot could overload the aircraft with the SCAS off but control forces were considered light in both modes. There was some discussion on whether or not the YC-15 should have a stick or yoke for control input. The intention was to have a “fighter-type” stick installed but there was some skepticism over it’s suitability from higher up the chain-of-command so the stick was removed. To counter, it was argued that the yoke obscured the view of the instrument panel. The YC-15 had no natural warning upon entering the stall (i.e. vibration) so warning for the stall relied on an artificial “stick-shaker” to provide some warning within the critical angle of attack. This was judged as an inadequate solution because the shaker could activate in conditions of high thrust and flap settings when the aircraft clearly wasn’t in a stalling condition and because a high stink rate (such as during a STOL landing) could mask stalling conditions. As such, a Supplemental Stall Recognition System (SSRS) was developed and tested during the program. The SSRS provided an aural warning when the aircraft approached critical alpha during a given flight condition. At gross weights of 149,300 the YC-15 flew STOL approaches at 87kts at a 6 degree glideslope giving a sink rate of 15.4 degrees per second. Conventional Takeoff and Landing (CTOL) approaches were normally made a 127 kts with a typical 8-12 feet per second sink rate with no flare at touch down. In STOL mode the aim-point for touch down was about 300 feet from the runway threshold . The YC-15 tested both flare and no-flare landing techniques in STOL mode. 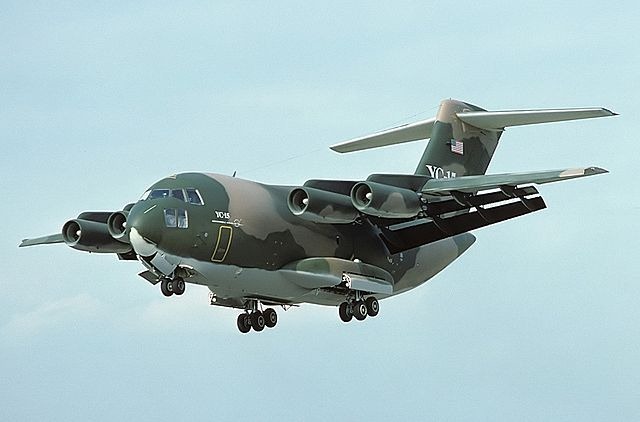 Testing at Edwards AFB showed the YC-15 was unable to land consistently in “hot-and-high” conditions in the required 2000 feet because of the slow actuation of the thrust reversers. The thrust reversers could be used in-flight with some minor airframe buffet. Testing the VAM, used approaches very similar to Navy carrier approaches were airspeed on approach is governed by angle of attack. The major issue was that the VAM didn’t display enough information to enable a completely “eyes-out-of-cockpit” approach. During testing cracks were found in the blown flap material and fasteners had to replaced on a cracked rob. This was due to repeated exposure of hot jet exhaust. Direct Lift Control (DLC) (*see update below) was found to be effective for corrected high approach errors in the glide-slope but wasn’t effective for getting too low during approach. Flight path correction was done with a slightly high arrival at glideslope,correct with DLC, and then add thrust. Maximum DLC deflection angle was 20 degrees from flush on the upper surface of the wing. Orientation of the DLC actuation in the cockpit was a major “human factors” issue of debate among the pilots. The YC-15 displayed docile engine out characteristics with mild crew indication 4-6 seconds after an engine out occurred. The YC-15 also was unable to meet the range requirement of 2600nm. The aircraft had more drag than predicted giving it a range of 1760nm. I’ll be standing fast on this post for now. I’m splitting part 2 into this and an additional part detailing some of the operational and international demonstrations as well as technical improvements and further flight test results. *[UPDATE]: For reader that may not know, direct lift control (DLC) is a system of spoilers, located on the upper surface of the wing. that either differencially control roll and in unison control pitch by dumping lift from the wings. They are common to most airliners. The only other DLC equipped airplane I’m familiar with was your favorite, the F-14. Would you mind describing it to our less technical readers? I understand the concept, but am not sure I could describe it without significant error. I am reminded of BaE 145’s looking at this ship even though the sizes were quiet different. Picqued my memory. Looks like the jet version of the 130, but the engines were over the wing, saw that up in klamath falls once. Almost as cute as the converted 123, that was being used by some contractors there.